Inhalation is the process of taking in air containing oxygen, while exhalation is the process of giving out rich containing carbon dioxide. This is the basic process of breathing. Here one breath involves the one complete inhalation and exhalation. So breathing rate varies from person to person and different kind of activity they perform in a day. Though on an average, the breathing rate of an adult is 15-18 times a minute, however, it may increase up to 25 times per minute in case of heavy exercises, while running or fast walking. There is a lot of confusion between breathing and respiration, so it can be simply understood by saying that breathing involves the process of exchanging of gases like oxygen and carbon dioxide from the lungs with the help of various respiratory organs. While respiration is a complete biochemical process, where the cells of organisms gain energy by combining oxygen and glucose, which results in giving out carbon dioxide, ATP (adenosine triphosphate) and water. As this article is focused on the breathing processes, which are inhalation and exhalation. Thus, we will consider the basic difference between the two with the brief description. Meaning Inhalation is the process of intake of air into lungs. Exhalation is the process of letting air out from lungs. Type of process Inhalation is an active process. Exhalation is a passive process. The role of diaphragm They contract during the inhalation and get flattens by moving down. They relax during exhalation and turned into dome-shaped by moving up. The role of intercostal muscle Internal intercostal muscles relaxes and external costal muscles contract. Internal intercostal muscles contract and external intercostal muscles relax. The volume of lungs It increases during inhalation means it get inflated. It decreases during exhalation means it gets deflated. The size of chest cavity Increases. Decreases. It results Air rich in oxygen is taken into the blood. Carbon dioxide is pushed out. Effect of intercostal muscles Due to the effect of intercostal muscles rib cage moves upward and outward. Due to the effect of intercostal muscles the rib cage moves downward. The composition of air The air which is inhaled is oxygen and nitrogen mix. The air which is exhaled is carbon dioxide and nitrogen mix. Air pressure Decrease in air pressure (below atmospheric pressure). Increase in air pressure. It is also known as ‘Breathing In‘. When we breathe in or inhale the air through nostrils, it then passes through the nasal cavity, from here the air rich in oxygen reaches the lungs through the windpipe. The lungs which are located in the chest cavity are surrounded by the ribs, which forms the cage like structure called rib-cage, and has a large muscular sheet known as a diaphragm, which lies the bottom of the cavity. When the oxygen-rich air reaches here the diaphragm contracts or tightens and move downward. The space in the chest cavity increases, the place into which the lungs get expand. The chest cavity also gets enlarged due to intercostal muscles present between the ribs. This help in the contraction and pulling of rib cage both outward and upward. As soon as lungs expand, air enters through the nose or mouth. This air travels downward through the windpipe and into the lungs. The air certainly reaches the alveoli, after passing through bronchial tubes. The air passes to the nearby capillaries (blood vessels), through the thin walls of the alveoli. Now, this air (oxygen) moves to the blood from air cavity with the help of a protein called hemoglobin. Simultaneously, on the other side, the carbon dioxide also shift from capillaries to air sacs. The movement of gas is through the pulmonary artery into the bloodstream from the right side of the heart. Further, this blood rich in oxygen is carried to the pulmonary veins through a network of capillaries. The role of the pulmonary vein is to deliver oxygen-rich blood to the left side of the heart. This side of the heart pumps the blood to the rest of the body. From there the blood moves into the surrounding tissues. It is also known as ‘Breathing Out‘. The process is opposite to that of inhalation. In this, the diaphragm gets relaxed and moves upward into the chest cavity. Even the intercostal muscles between the ribs also get relax, which reduces the area in the chest cavity. Gradually, the area in the chest gets decreased and air rich in carbon dioxide is forced to move out of the lungs and windpipe and finally out through the nose. 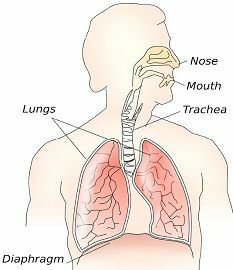 Inhalation is the process of intake of air into lungs, whereas exhalation is the process of letting air out from lungs. Inhalation is an active process, though exhalation is a passive process. The diaphragm contract during the inhalation and get flattens by moving down, while they relax during exhalation and turned into dome-shaped by moving up. The intercostal muscles relax and external costal muscles contract in the inhalation process, while in the exhalation process internal intercostal muscles contract and external intercostal muscles relax. The volume of lungs increase during inhalation it means it gets inflated and it decreases during exhalation means it gets deflated. The size of chest cavity increase in inhalation and it decrease during exhalation. During the inhalation air rich in oxygen is taken into the blood but carbon dioxide is pushed out in exhalation process from the blood. Due to the effect of intercostal muscles rib cage moves upward and outward in inhalation, while in exhalation the rib cage moves downward. The composition of air which is inhaled is oxygen and nitrogen mix, while the composition of air which is exhaled is carbon dioxide and nitrogen mix. Inhalation results in a decrease in air pressure (below atmospheric pressure). 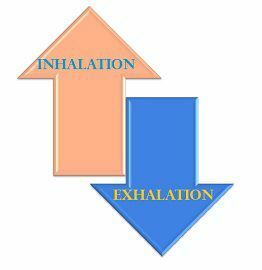 In exhalation, there is an increase in air pressure. Simply we can say that the giving and taking process is called breathing. In this process, while breathing we take in air rich in oxygen from the atmosphere and give out the carbon dioxide back to the atmosphere. This air (carbon dioxide) is utilized by the plant during day time in the process of photosynthesis. And hence the cycle goes on continuously, which is significantly important for all the living beings. Thank you so much for creating this website! It has been a very informative and fantastic resource! Without this site, we would have never been able to comprehend the primal human function. Got very much information from this article.